Matter waves are a central part of the theory of quantum mechanics, being an example of wave–particle duality. All matter can exhibit wave-like behavior. For example, a beam of electrons can be diffracted just like a beam of light or a water wave. 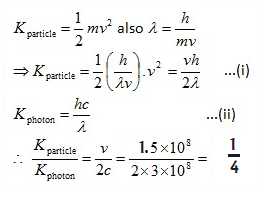 The de Broglie equation is an equation used to describe the wave properties of matter, specifically, the wave nature of the electron: λ = h/mv, where λ is wavelength, h is Planck's constant, m is the mass of a particle, moving at a velocity v. de Broglie suggested that particles can exhibit properties of waves.